Physics Lecture Hall Location-Directions and show abstract same as Children�s Lecture below. For all Rutgers Day Activities click here. To see the entire Rutgers Faraday Children's Lecture from 12/6/13 click here. Fri. Dec. 8, 2017 show video. Sat. Dec. 9, 2017 show video. Sun. Dec. 10, 2017 show video. Printable Show Announcement to Post at School-Office etc. To contribute toward expansion of activities like the Faraday Lecture (or to view contributor acknowledgements) click here . Sample Lecture Program and an Index to demo pictures/explanations. A more extensive under-construction video and explanation collection. In 1826, physicist Michael Faraday founded the Children's Christmas Lectures at London's Royal Institution. His goal was to communicate to children the excitement of scientific discovery. 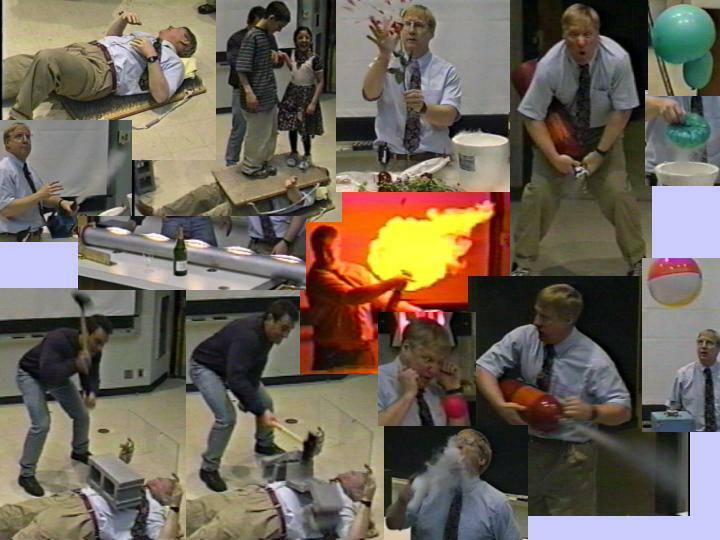 In keeping with the spirit of those lectures, Mark Croft, a professor of physics at Rutgers, and physics support specialist Dave Maiullo present a physics demonstration and lecture show for children of all ages each Dec. and on special occasions, like Rutgers Day . This event is held in the Physics Lecture Hall at 136 Frelinghuysen Road, on the Busch campus in Piscataway. Driving Directions The event is free of charge and open to the public. (NO PARKING PASS REQUIRED) The demonstrations presented are based on those used in our physics courses. They were designed not just to inform but with an eye toward humor and exciting the imagination. The object of the show is to emphasize the fun in science. Demonstrations will include an exploding hydrogen balloon, a man lying on a bed of nails and the use of a fire extinguisher to shoot a person on roller skates across the room. 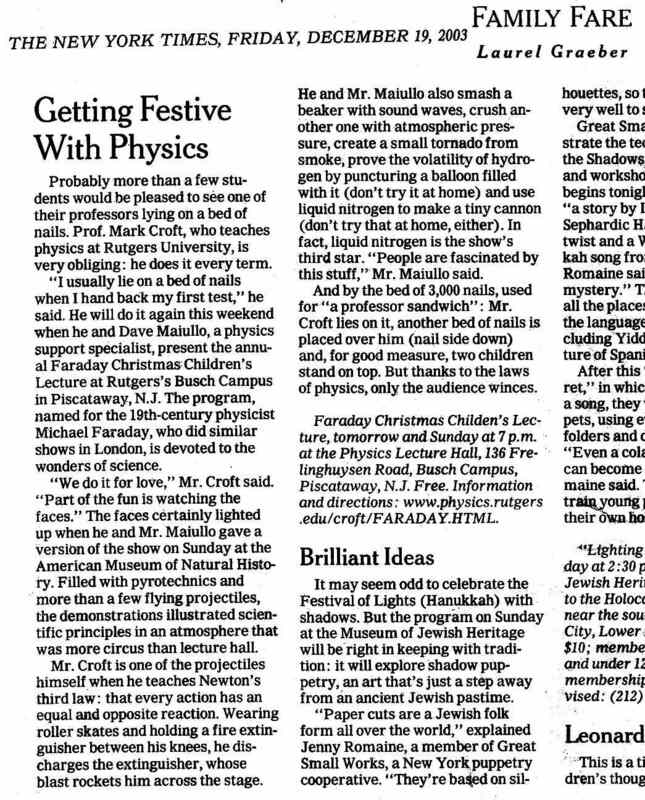 RUTGERS TODAY: Rutgers Physics Shows Have Thrilled Thousands for 20 Years. See the fun. Pictures (.pdf) from the 2017 20'th ANNIVERSARY show. See the fun. Pictures (.pdf) from the 2007 10'th ANNIVERSARY show. See the fun. Pictures (.pdf) from the 2011 show. See the fun. Pictures (.pdf) from the 2010 show. See the fun. Pictures (.pdf) from the 2009 show. Pictures (.pdf) from the 2008 show. Pictures (.pdf) from the 2004-2005 shows. Pictures and information from past lectures. Link to Rutgers Astronomy telescope public viewing sessions. Directions to the Physics Lecture Hall can be obtained at http://www.physics.rutgers.edu. This page has been accessed times since December 9, 1999. Please send any comments on this page to webmaster@physics.rutgers.edu.